Yesterday our sweet Adelyn turned 2 months old. It's amazing how fast time flies! She has changed a lot in the past month. She now watches us as we walk around the room. And she smiles all the time, SO CUTE! She loves to carry on conversations with us. When she's fussing and Daddy starts to talk to her real slowly she just closes her eyes and goes to sleep!! That deep voice just lulls her away. 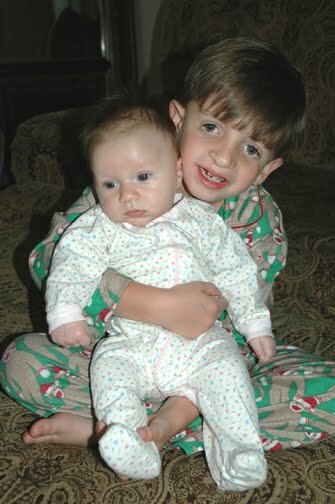 :) She LOVES her big brother, anytime he comes over to her she lights up and just stares at him. She is still eating every three hours during the day and every three to five at night. She has gone eight hours twice but she fell asleep around seven so I missed out on sleeping some of those hours. Bummer! :) She has a really sweet little personality and we are just loving her up around here. I took some pics of her yesterday, she did way better than her 1st month pics! 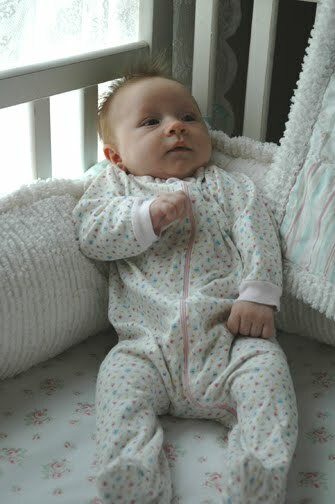 Here she is in her adorable crib that she still has yet to sleep in. 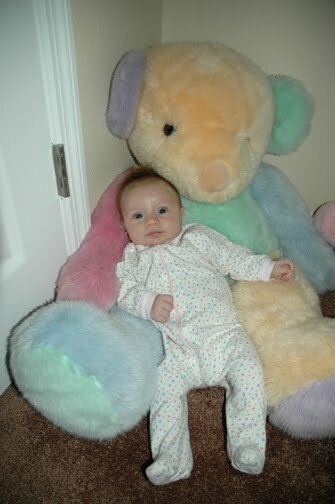 And a pic with her huge bear. Great pics... 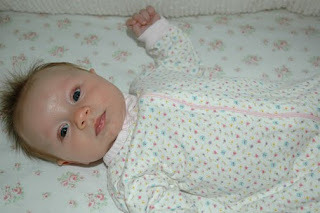 I love babies in pj's :) so cute!